World No. 3 Grigor Dimitrov will headline the field at next month’s Dubai Duty Free Tennis Championships, which is missing notable regulars like Roger Federer, Novak Djokovic and last year’s winner, Andy Murray, who is recovering from hip surgery. 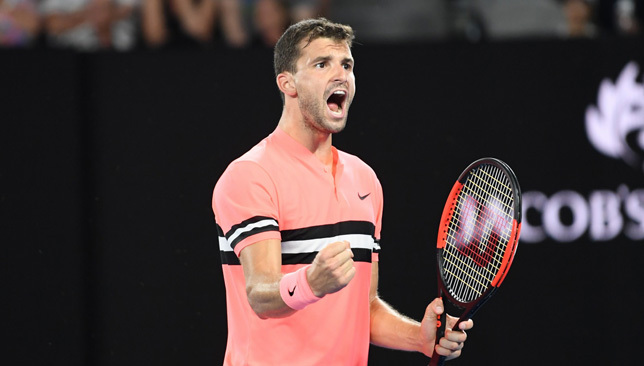 Dimitrov, who entered the top-three for the first time after winning the ATP Finals last November, will be making just his second Dubai appearance, and first since 2011. He is joined by Dubai resident Lucas Pouille, Richard Gasquet, Roberto Bautista Agut, Karen Khachanov, Damir Dzumhur, Borna Coric with Italian world No. 73 Thomas Fabbiano the last direct entrant into the draw. Federer, a seven-time champion and resident of Dubai for nearly a decade, was shocked in the second round by Evgeny Donskoy last year in the emirate. The 36-year-old world No. 2 has been cutting down on his schedule to lengthen his career, and it looks like Dubai didn’t make the cut on his calendar this season. Alternatively, he could be playing Acapulco, which coincides with the Dubai week on the ATP calendar. Acapulco used to be played on clay for 20 years before the tournament switched its surface to hard courts in 2014. Since then, it has been directly competing with Dubai — also played on hard courts — when it comes to attracting the best players in the world. Djokovic, who told Sport360 last month that he was still undecided on whether he will play the Dubai/Acapulco week and that it will depend on how he is feeling physically, chose the tournament in Mexico last year over a trip to the UAE. Rafael Nadal also played Acapulco in 2017, losing the final to Sam Querrey. This year, Acapulco features a marquee line-up that includes Nadal, Alexander Zverev, Dominic Thiem, Kei Nishikori and Juan Martin del Potro. The Dubai Duty Free Tennis Championships takes place from February 19 to March 3, starting with the WTA event, followed by the ATP (starts February 26). Grandstand ticket prices for the WTA event start at Dh55 for opening rounds to Dh735 for the ATP finals, with daily Prime A and Prime B tickets and season tickets also available (all inclusive of VAT). Tickets went on sale online on Thursday January 18 at www.dubaidutyfreetennischampionships.com/en/tickets, and will be available at the Box Office from Thursday January 25. The 25th edition of the Dubai Duty Free Tennis Championships wraps up on Saturday night and it was quite fun getting the players to reminisce about their early memories of the tournament. 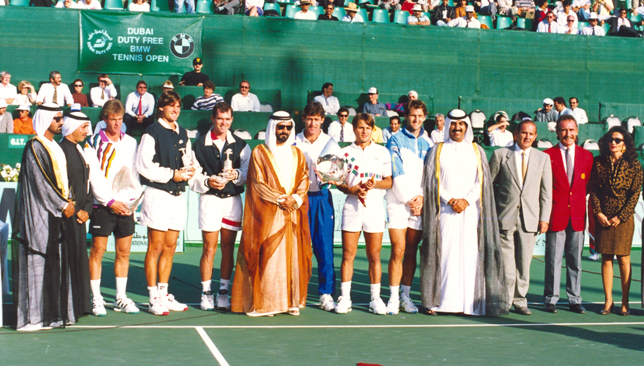 When tennis touched down in the Arabian Gulf for the first time in 1993, there was so much scepticism and uncertainty about the event simply because no one knew anything about Dubai or Doha and it was the players’ curiosity that brought them to the region early on. “The first time, February 1993, when I saw an ATP tournament in Dubai on the calendar I said ‘wow’, more or less, ‘where is that?’ That was my first reaction but my second was that ‘I wanna go’,” Fabrice Santoro, the runner-up of the inaugural Dubai edition told Sport360. “It’s always a great opportunity when you do this job to see new places, new cultures and everything. So I entered the tournament. I went there and it was the beginning of the opening of Dubai, a couple of hotels, a couple of buildings but not many. A lot of sand in the city and the old city was there, and when you look at what Dubai became 25 years later it’s one of the biggest transformations I’ve seen in the world. Probably the biggest. “I remember when Sheikh Mohammed (bin Rashid Al Maktoum, ruler of Dubai, vice president and prime minister of the UAE) gave us the trophy. It was unique to get a trophy as a finalist from his hands. The retired Frenchman enjoyed lots of success in the Gulf region, reaching four singles finals combined in Dubai and Doha, and capturing the title in 2000 in Qatar and 2002 in the UAE. “I always played well in the Middle East, I won just six tournaments in my career and I won Doha and Dubai, and I also won both in doubles,” recalls Santoro. Kournikova in Dubai in 2002. The tournament didn’t just bring some of the best players in the world to Dubai, it also helped Arab players by providing wildcards, giving them a chance to gain some ATP or WTA points by competing in events they wouldn’t necessarily have been able to compete in with their ranking alone. Tunisian Selima Sfar, who is the only Arab woman to ever crack the top-100, has fond memories of playing at the Aviation Club, where she reached the quarter-finals in the inaugural women’s edition in 2001. “I remember for myself, especially in Dubai, I always played very well, I have my best memories here,” recalls Sfar, who is now a commentator and analyst for beIN Sports. 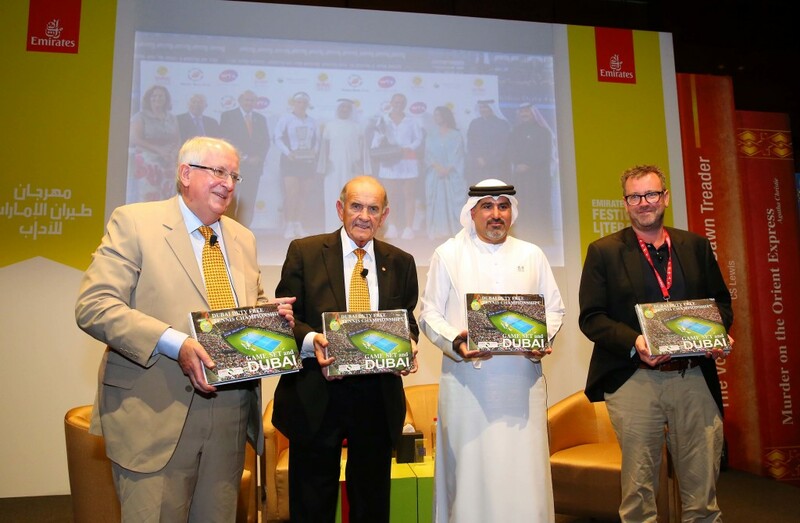 DDF chiefs unveil the book at the Emirates Airline Festival of Literature. To celebrate the tournament’s silver jubilee, Dubai Duty Free published a book called ‘Game, Set and Dubai: A Quarter Century of the Dubai Duty Free Tennis Championships’ that includes an extensive history of the event as well as the early sports revolution that put the emirate on the global sports map. It includes some fascinating old photos of Dubai – including an aerial view of Emirates Golf Club from the late eighties when it was only surrounded by the desert – and is definitely worth a read. It’s been a real treat coming to this tournament for the past 10 years and hopefully it sticks around for at least another 25. The top seed managed to avoid joining second seed Stan Wawrinka and seven-time winner Roger Federer on the sidelines after the Swiss pair crashed out in earlier rounds. But world number one Murray needed to scrap and struggle for almost three hours against 33-year-old Kohlschreiber, with the pair duelling in a 31-minute second-set tiebreaker which determined the final direction of the epic quarter-final. “It was very rewarding to come through a match like that and obviously I’m very pleased to get through it,” Murray said. “I would have been very disappointed if I’d lost the second set, but also, I didn’t feel like I was playing badly. The Scot held off Kohlschreiber’s match points, but still needed eight set points to take the contest into a decisive final set. Thursday’s dramatic second set equalled five other 20-18 tiebreaks recorded since tiebreak scores were first kept in 1991. “I’ve never played a tiebreak that long ever. Not in juniors, nothing even close to that, I’ll probably never play another one like that again,” Murray said. In the bottom half of the draw, fourth seed Gael Monfils fired 10 aces but still crashed out 6-3, 7-5 to Fernando Verdasco. Spain’s Verdasco will play his second semi-final of the season on Friday, facing Dutchman Robin Haase, a 6-2, 4-6, 6-4 winner over Bosnian Damir Dzumhur.